Yesterday while sealing a few minutes for myself I strolled out into my front yard for a look around, just sauntering as it isn’t a very big yard, and wanted to take a closer look at what I see everyday without actually seeing it. How many times a day do I cross my lawn, walk up the path to the house, come and go? Do I really notice any of the sights I see so many times per day? Some might call it ‘taking time to smell the flowers’ except I have no flowers. I have a little boy who loves to pick flowers so any that should pop up whether a dandelion, day lily or other always get picked straight away. But that’s alright because they end up in a little glass knickknack on the ole kitchen window sill. What I do have in my yard is a very scraggly old and crooked remnant of a walnut tree. I have seen some beautiful walnut trees in my life, and you should know, this tree doesn’t even come close to measuring up. It has a mind of growing toward the house in a zig-zag way, looming over the roof and depositing walnut hulls all over once per year. It looks more like a two pronged walnut stick that is one hundred feet tall. No smaller branches, very few leaves; I am not sure how it has survived all these years and I anticipate its demise each time a strong storm passes through, but yet it stands, for now. The right side of the lawn seemed to be blooming yesterday in cracked walnut shells like the one pictured above. I almost didn’t see them for taking for granted what is always there. 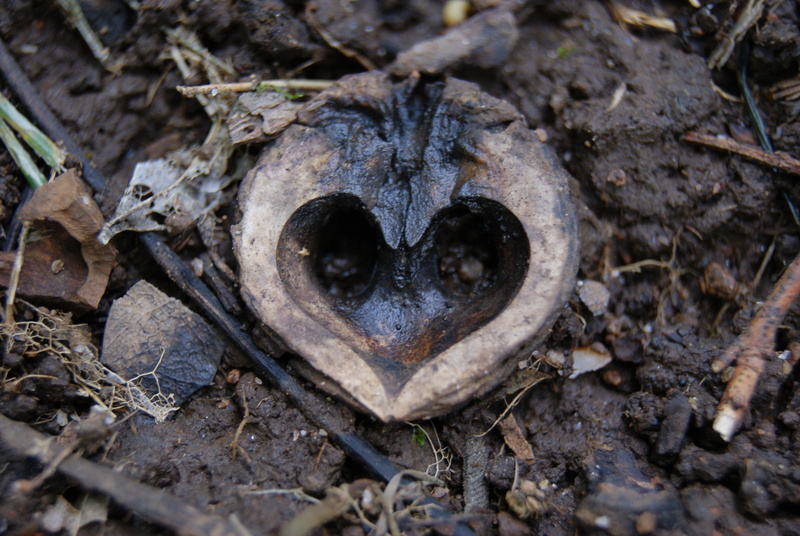 When I bent down to take a closer look, the little heart, nature’s love called to me. It gave me pause to remember how strong nature can be, and the grace that created nature itself. 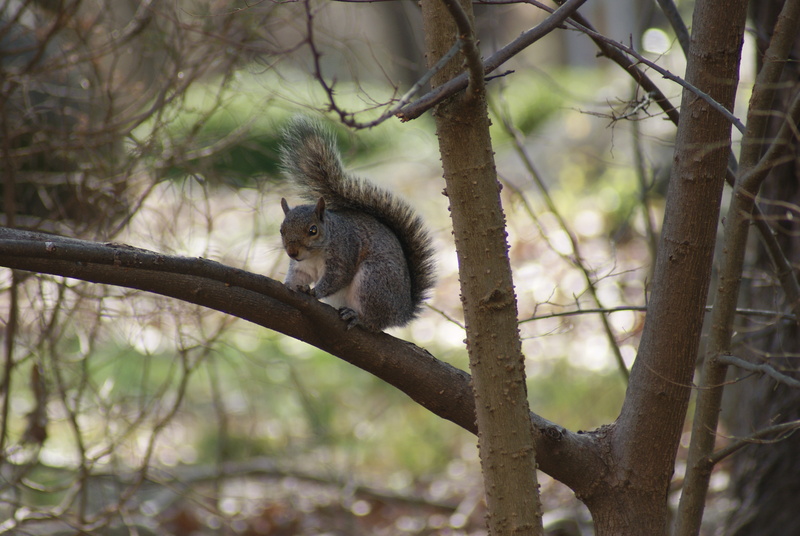 Another aspect of my yard is the ever present gray squirrel; not one or a few, but hundreds of these little furry creatures scamper through the yard, up and down the trees, over the rocks across the lawn always scurrying digging little shallows wherever they think they deposited their treasures. Friendly enough we don’t try to pet them or catch them, just watch them as they come and go. They don’t mind us as they lived here long before we did. We gave them the name of Fred. Fred one and all, each one we see we greet and they seem to know we are speaking to them. I think these little and sometimes quite plump fellows find our yard and surroundings as a safe haven. Our neighborhood is not young so the houses and yards are established with large oaks, hickory and pines. Squirrel nests abound galore, multiple in every tree. We seem to co-exist with each other quite nicely. Sometimes they nibble things they aught not nibble when the eats are scarce. They do have a fun past-time of popping a squat in the branches above our entrance door. This is their shelling place. They must carry all of their nuts to this one spot to shell them. Quite smart they are as they keep the goodie for themselves and drop the shells beneath. However, what is beneath is our heads! I think I have almost heard them giggle as if it is a game to see how many times they can ding us. Of course, during this time the front stoop is always covered with shell droppings and they are forever getting stuck in the bottoms of ones shoes, but a little sweep now and then clears them all away. 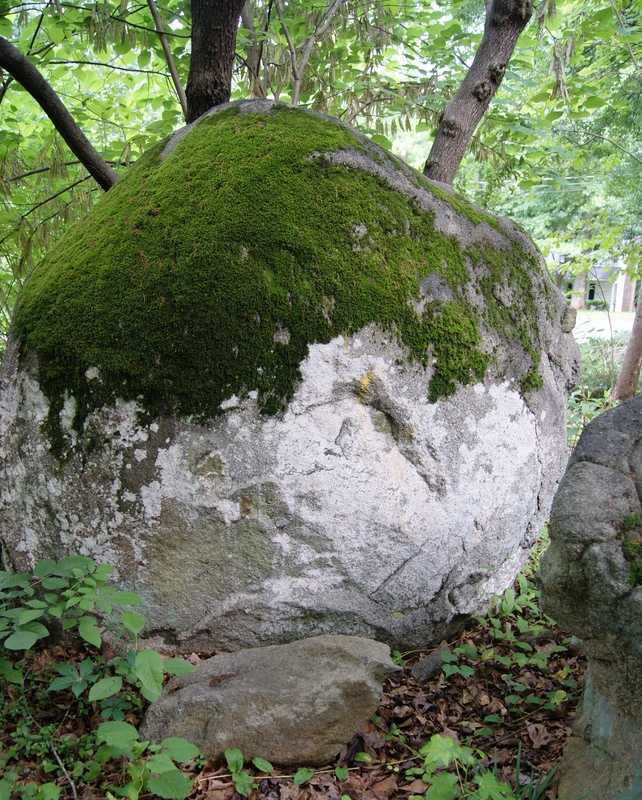 Another wonderful natural beauty in our yard is our boulders. Tons by tons in size and volume of these remarkable statues of stone exploding from the earth like enormous private barriers. Both sides of our lawn hold these wonders; it makes one feel protected and safe. Ever slightly changing with the seasons they always have a slightly different look. The children have climbed on these friendly monsters since they first saw them years ago. These massive friends have given them more enjoyment than any video game ever could. Shown here is one of our largest covered in stunning green moss and white lichens. Lastly, is a rare glimpse of our friend Mr. Owl. 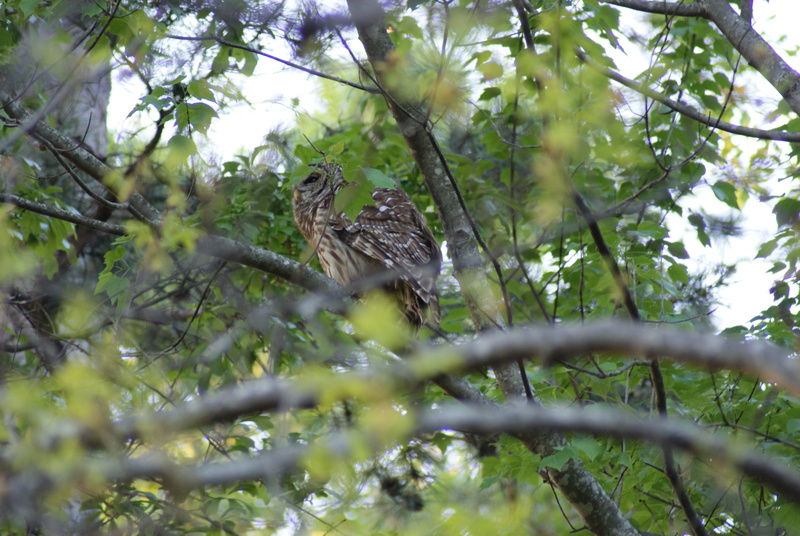 This is one of a pair who reside in the enormous Oaks. He and his owl-mate were here when we arrived and don’t mind us very much. They are not quite the type one can classify as a ‘pet’ but they do keep us company with their hooting. Actually, we love to hear them converse among themselves. Above is a very difficult shot to obtain as they don’t show themselves in the open very often combined with our heavy tree foliage crisp clear photographs are hard to grab. Here he appears to be peeking at me, yes, he knows I am there.